Recently, I spent a day with 50 HR-tech executives from Fortune 100 companies. When I asked, “Who has an ongoing project using AI?” about 40 percent of the group raised their hands. When I asked, “Who has a people-analytics team?”, it was more like 60 percent of the group. Indeed, people analytics is coming to a theater near you. 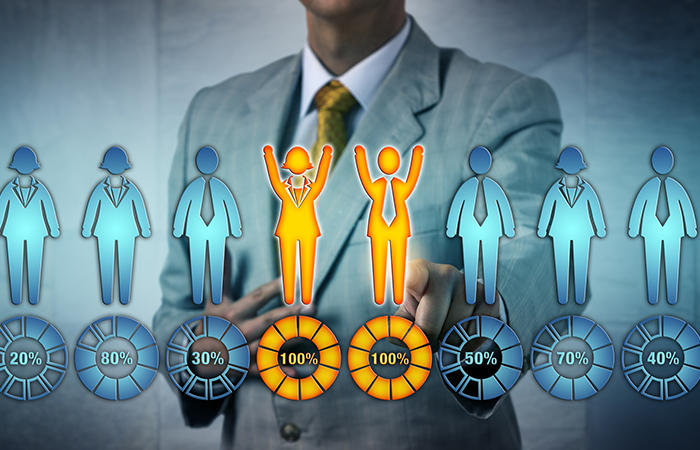 People-analytics teams range in size from 2 percent to 7 percent of the total HR workforce. Sophistication spans the range from none to groundbreaking. For some, PA is the reporting of standard HR metrics. For others, it is the place where data science takes root in the HR department. Today, there are at least two-dozen vendors offering different kinds of PA tools. Ranging from templated reports and dashboards to automated data-cleaning services, they are the advance guard in HR’s move toward data and quantification. The most primitive tools are essentially the latest form of benchmarking, while the most sophisticated offer the capacity to fine tune HR delivery to optimize organizational performance. And these are the tools with an explicit focus on HR. Many large PA groups blend the best reporting from their enterprise provider, BI tools from non-HR sources and data-visualization tools like Qualtrics. The goal of a great people-analytics program is to help an organization deeply understand the workforce and improve its alignment with the business model, objectives, growth and productivity. Understanding how people learn about, join, evolve, progress, interact with and leave a company helps both management and employees. A clearer picture of the culture and its strengths, weaknesses and normal processes makes operational execution simpler, easier and more effective. The first step in developing a PA function is getting the data ready. A decade’s worth of enterprise tools that encourage idiosyncratic workflows made a spectacular mess of the company’s most important infrastructure, its data. The process of tidying up the data and the workflows that generate them is intensely political and slow going. But in order to get to the next level, it’s a necessary component. Vendors vary by the degree to which they attend to this problem. There are four major categories of vendors delivering the most promising people-analytics insight and data. Vendors in this category get their clients up and running quickly with a templated approach. The best in this group allows you to test solution scenarios. They often provide industry-wide data for benchmarking purposes. They’re a great place to start. Examples: Humanyze, TrustSphere, Keen Corp.
An appetite for PA often evolves into a desire to understand the organization’s underlying network. Sometimes called the “real org structure”, the actual network is much more than the lines and boxes on the formal org chart. These vendors provide a picture of the inner workings of the companies. They range from trouble spotting to non-judgmental mapping. There are a number of approaches to managing the company’s data. SwoopTalent is building an automated way to avoid the political mess of data governance. Other companies in the sector focus on the standardization of the application-program Interface, which allows the company to reliably move data around. This is the way data will be managed. One model provides the tools for building data science models tailored to each individual company. OneModel’s approach is significantly different from the rest of the pack. It understands the dynamic nature of organizations and provides monitoring and maintenance capacity for the inevitable moment in which a data model ceases to be effective. In the beginning, companies tend to look at attrition, engagement, promotability, promotion paths, management structure, people spend optimization and recruiting for retention. These issues are all part of the distinguishing characteristics of an individual organization. Yet, most HR departments are still primarily relying on benchmarking. Where industry data and models are available, benchmarking can cover 50 percent or 60 percent of the people-analytics territory. The very last thing you want is to be like everybody else. Benchmarks quickly become prisons. It’s also not reasonable to think of PA on a maturity curve. What makes sense for a given company depends on size, region, industry, business model and product/service lifecycle. Instead, each company is going to find the place where investment and return balance out. What constitutes great PA practice is unique to the culture, structure and goals of each organization. I’ll be talking about the evolution of people-analytics-tool providers in my presentations at the upcoming HR Technology Conference in Las Vegas.